« Are You a Wine Lover? Then Be Sure to Attend the Ruth’s Chris Steak House 90+ Wine Dinner on August 23rd! Are you a teacher looking for free, quality resources to help instruct students on managing their personal finances? The nonprofit Alliance for Investor Education (AIE), a consortium of America’s top regulatory, self-regulatory and industry organizations focused on investor education, is now making available in one place a variety of resources online at http://www.investoreducation.org. AIE is outlining 10 of the best Web-based resources for teachers looking to give their students a strong base of knowledge in investing and personal finance so they will know how to properly manage their finances as they grow into adulthood. The Alliance's new "Investing and Finance for Kids" is available at http://www.investoreducation.org/kidsinvest. AIE is the organization of the United States’ leading financial-related foundations, nonprofit organizations, associations and governmental agencies. Alliance for Investor Education President Sue Duncan, who also serves as vice president of the Investment Company Institute Education Foundation (ICIEF), said: "The best way to make sure Americans know how to save and invest wisely as adults is to start early. Educators are a key source for sharing that knowledge with kids starting at an early age and as they grow. The Alliance for Investor Education wants to make sure all teachers have access to the best tools for showing children the importance of saving and investing their money so they are best able to meet their financial goals as they grow." Teachers within the greater metro DC area can apply for ICIEF grants of up to $25,000 each (http://www.icief.org/icief_grant_guidelines.html) for starting or expanding investing education classes, programs, or activities at their schools. 1. How to Make Personal Finance "Connect" With Young Adults - http://bit.ly/R0BHPw, American Association of Individual Investors. 2. Generation Money - http://bit.ly/Ov1EWA, FINRA Investor Education Foundation, Channel One News, and the Consumer Federation of America. 3. Live "Stock" Adventure - http://bit.ly/OEcwQp, North American Securities Administrators Association. 4. High School Financial Planning Program - http://bit.ly/NEuOTl, National Endowment for Financial Education. 5. Saving and Investing for Students - http://bit.ly/MuMnku, U.S. Securities and Exchange Commission. 6. 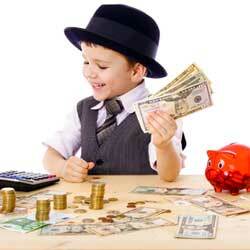 Kids & Money – Preschoolers through Teenagers - http://bit.ly/Q89iFc, Employee Benefit Research Institute. 7. Stock Market Game - http://bit.ly/Q89sfU, SIFMA Foundation. 8. Teach Investing - http://bit.ly/N7sLlI, Investor Protection Trust. 9. Teaching Your Teen About Money - http://bit.ly/LZnel4, 360 Degrees of Financial Literacy/American Institute of Certified Public Accountants. 10. Federal Reserve Kids Page - http://bit.ly/MW0DoQ, Federal Reserve Board. Suffering from Holiday Shopping Procrastination? Then Try These 6 Tips for Late Holiday Shopping!